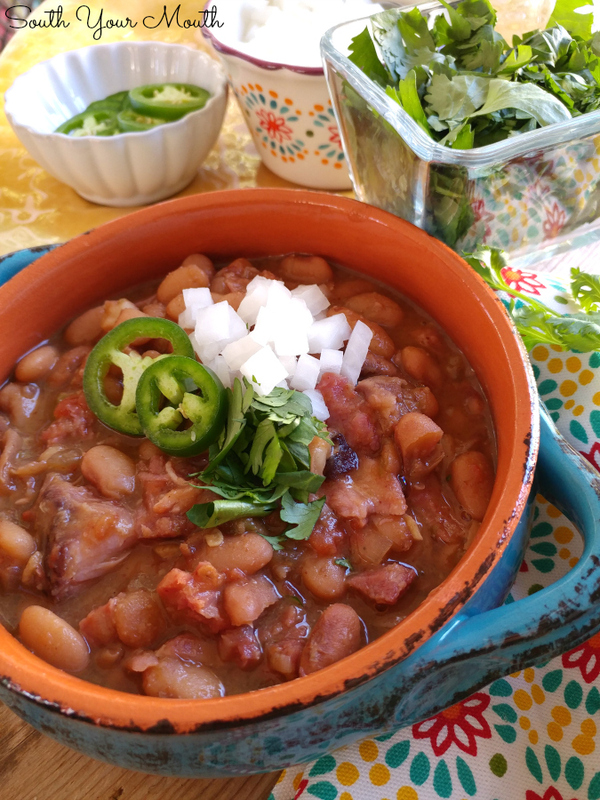 Mexican Borracho Beans cooked low and slow with pinto beans, pork, spices and beer. THE PERFECT side dish recipe for your next Mexican feast! 1) ‘Borracho’ is Spanish for ‘drunk’. 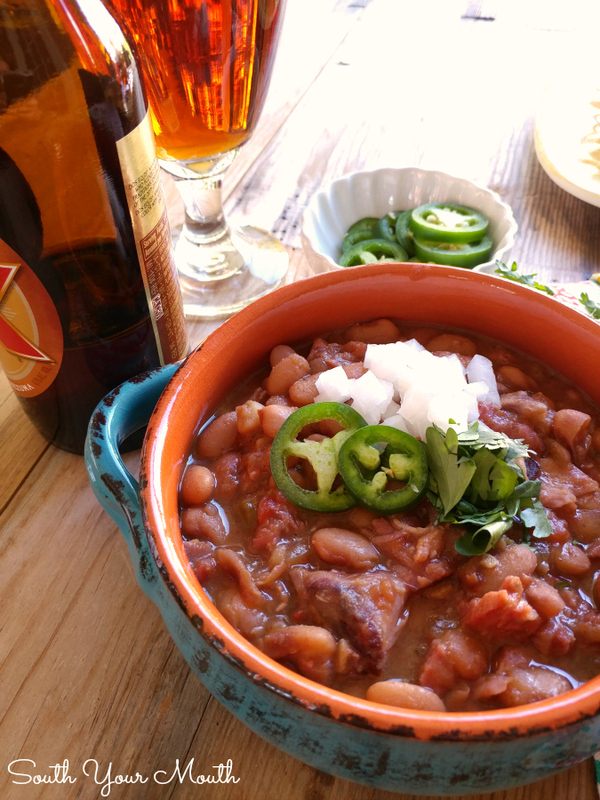 2) Borracho Beans are pinto beans cooked low and slow with pork, Mexican spices and… BEER! 3) I had to make some. Immediately. Y’all know how much I love dried beans but you may not know that I also really, seriously, absolutely, dearly love beer. With all the microbreweries and IPAs popping up all over the place, beer has become the new “it” thing in libations but I loved beer long before it was cool. It’s 8:32 on a cool October morning and my mouth is watering just thinking about how crisp and refreshing an ice-cold beer is on a hot Southern afternoon! I am absolutely in love with this recipe! I served these with yellow rice and spicy pork tacos then froze a big container of the leftovers to pull out the next time we have a crowd over for carnitas. I can’t get over the layers of flavor in these beans. SERIOUSLY. I looked at a dozen or so recipes to orient myself with the basics (pintos, tomatoes, chilies, jalapenos, onion, some sort of cured pork, Mexican spices and BEER) then crafted my recipe. 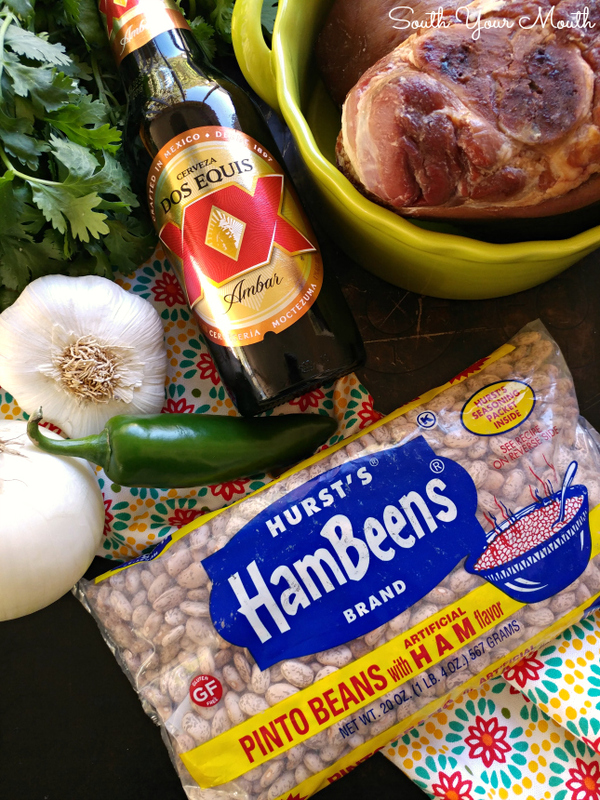 The two most important ingredients being the beans and the beer, I, of course, grabbed my Hurst’s Pinto Beans with the smoky ham seasoning packet because Hurst’s beans never, ever disappoint and I picked up a 6-pack of dark Mexican beer. Remove seasoning packet from beans and set aside. Add beans and next seven ingredients (through ham hocks) to large pot or Dutch oven, stir well then heat until boiling. Reduce heat to low, cover and simmer beans for one hour. Add seasoning packet from beans, cumin and chili powder to pot, stir well, cover pot then continue cooking for one hour or until beans are tender. Remove ham hocks from pot and set aside to cool. Increase temperature of beans to medium/medium-low and continue cooking UNCOVERED for 30-45 minutes or until sauce is thick and reduced. Meanwhile, remove meat from ham hocks, shred or cut into small pieces then stir into beans. Serve with fresh diced onion, cilantro and/or jalapenos. I used Dos Equis Ambar beer in this recipe. 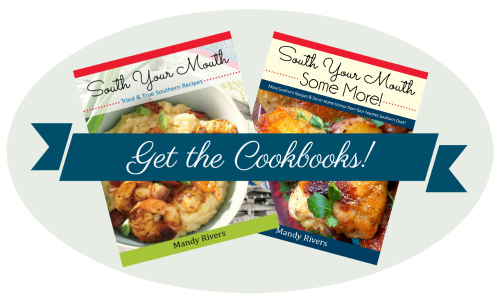 You could use bacon instead of ham hocks in this recipe too. Just dice and fry bacon until crisp before adding to the pot. HA! I'd wear that crown proudly!! Do the beans need to be presoaked overnight beforehand? This recipe looks wonderful! Thank you!! It really is delicious! No need to soak the beans overnight. I rarely do! I like the beans to absorb all the flavors from cooking liquid so I prefer to cook them all the way the day of vs. soaking them the night before. Can you taste the beer? I don't like the taste but these look AMAZING! Not at all. At least not in a way you'd imagine. I intentionally created this recipe to use only a little beer (though I think I'll make a note above that you can use more beer / less broth if you like beer like I do). What you taste is a mildly roasted back note that has a hint of chocolate. It's PERFECT with all the Mexican flavors! This looks so delicious.Can you cook this recipe in a slow cooker? And if so, what would be the time adjustment? I'm sure they'd be great in a slow cooker. Follow 1st paragraph but cook in slow cooker for 4 hours on high. Follow 2nd paragraph, cooking for 2 hours or until beans are tender. Then follow the recipe the same. Good luck! so glad you used ham hocks. All of those would work just fine but I'd go with the Guinness since it has so much more body and the coffee/chocolate undertones in there would be amazing with the Mexican flavors! After i found this amazing recipe, i make them at least once a month. They are really good, i add an extra can of stewed tomatoes, and have tried different beers. I don't think I could call myself a great cook if ever I added a "packet of ham flavoring" to anything! I'll definitely find a work around as I LOVE Borracho beans! 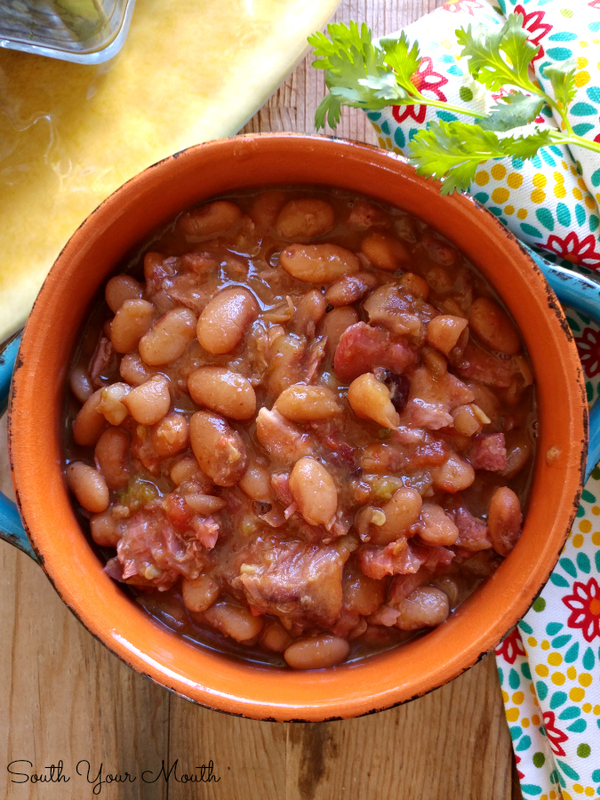 This is almost the exact same recipe I use for boracho beans. I add andouille sausage also. Gives it a nice kick. We use Goya ham flavor packets along with the ham hocks.